Why Would I Need an Endodontic Treatment? You’re probably reading this because your dentist or endodontist has said you need endodontic treatment. If so, you’re not alone. More than 14 million teeth receive endodontic treatment each year. By choosing endodontic treatment, you are choosing to keep your natural teeth as a healthy foundation for chewing and biting for years to come. If you’ve never had endodontic treatment–also known as a “root canal” — or if it has been many years since your last procedure, you may have questions or outdated expectations. Technology has advanced dramatically over even the past several years. Endodontists are dentists with special training in endodontic procedures; essentially, they are root experts. They only do endodontic procedures in their practices because they are specialists. To become specialists, they complete an additional two or more years of advanced training in endodontics following dental school. They perform routine as well as very complex endodontic procedures, including root canals, root canal retreatments, and endodontic microsurgery. For more information about each of these procedures, please read under Services. Endodontists are also experienced at finding the cause of oral and facial pain that has been difficult to diagnose. Endodontists may use advanced technology, such as microscopes, ultrasonics, and digital imaging to perform these special services. “Endo” is the Greek word for “inside” and “dont” is Greek for “tooth.” Therefore, endodontic treatment treats the inside of the tooth, or the pulp of the tooth. To understand endodontic treatment, it helps to know something about the anatomy of the tooth. Inside the tooth, under the white enamel and a hard layer called the dentin, is a soft tissue called the pulp. The pulp contains blood vessels, nerves, and connective tissue. Its main purpose is to develop the tooth during adolescence. Endodontic treatment is necessary when the pulp becomes inflamed or infected. The inflammation or infection can have a variety of causes: deep decay, repeated dental procedures on the tooth, a crack or chip in the tooth, or trauma. Trauma to a tooth may cause pulp damage even if the tooth has no visible chips or cracks. If pulp inflammation or infection is left untreated, it can cause pain or lead to an abscess. Signs of pulp damage include pain, prolonged sensitivity to heat or cold, discoloration of the tooth, and swelling and tenderness in the nearby gums. Sometimes, there are no symptoms, and the infection or inflammation can only be detected on the x-ray by your dentist or endodontist. The endodontist removes the inflamed or infected pulp, carefully cleans and shapes the inside of the tooth, then fills and seals the space. Afterwards, you will return to your dentist, who will place a crown or other restoration on the tooth to protect and restore it to full function. After restoration, the tooth continues to function like any other tooth. For a step-by-step explanation of the procedure, please read under Services: Root Canal Treatment. Many endodontic procedures are performed to actually relieve the pain of toothaches caused by pulp inflammation or infection. With modern techniques and anesthetics, patients generally report that they are very comfortable during the procedure. 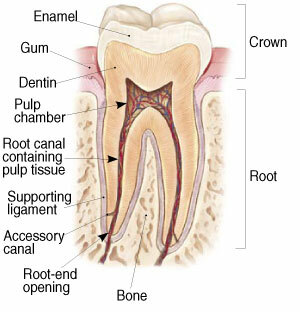 Many even say that getting a root canal is easier than having a crown prepared! While feeling pressure and vibration is normal during a root canal procedure, experiencing pain is NOT normal. If any pain is experienced, Dr. Potter asks that you raise your left hand so she can stop what she is doing and do everything in her power to get you more comfortable. For the first few days following treatment, your tooth may feel sensitive, especially if there was pain or infection before the procedure. This tenderness is especially prominent with biting on the tooth because the ligament that surrounds your tooth is starting to heal. This discomfort can be relieved with over-the-counter or prescription medications. Follow your endodontist’s instructions carefully. Generally, endodontic treatment and restoration of the natural tooth are less expensive than the alternative of having the tooth extracted. An extracted tooth must be replaced with a bridge or implant to restore chewing function and prevent adjacent teeth from shifting. These procedures tend to cost more than endodontic treatment and the appropriate restoration. For detailed information on cost, please consult with our office’s financial manager. If cost is a concern, we offer interest-free financing through Care Credit. You can gather more information about this financing at www.CareCredit.com. For more information, please view our Forms & Policies page. You should not chew or bite on the treated tooth until you have had it restored by your dentist. In addition to it being sore to biting for the first few days, accidentally biting something hard before you see your dentist can be detrimental to the long-term success of the treatment. The un-restored tooth is susceptible to fracture, so you should see your dentist for a full restoration as soon as possible. Otherwise, you need only practice good oral hygiene, including brushing, flossing, and regular checkups and cleanings. New trauma, deep decay, or a loose, cracked, or broken filling can cause new infection in your tooth. In some cases, the endodontist may discover very narrow or curved canals that could not be treated during the initial procedure. For further information about root canal retreatment and endodontic (apical) surgery, please read under Services: Root Canal Retreatment and Endodontic (Apical) Surgery. No matter how effective modern tooth replacements are–and they can be very effective–nothing is as good as a natural tooth. Your root canal has now been completed. The canals have been cleaned and sealed. Your body must now have time to repair the tooth and its surrounding area. It is normal for the tooth to be very sore for the first few days, and it may remain sensitive to biting pressure for up to six weeks. Three Advil (600mg total) or 2 Extra-Strength Tylenol (1000mg total) every 4-6 hours will usually relieve the soreness. If the discomfort is more severe, please let us know so that we may prescribe an appropriate medication. If pain persists or increases, or swelling develops, please contact the office. Antibiotics are generally not required following root canal therapy. Your doctor will prescribe them when indicated. Do not chew on the tooth until all tenderness is gone. This will likely be at least 3 days. This will prevent you from bumping the sore tooth and allow it to heal. Many times after endodontic treatment a temporary filling is placed in your tooth. You should now return to your dentist, who will place the appropriate final restoration. Do not chew on your treated tooth until it has been properly restored by your general dentist. There is a risk of fracturing the tooth. If it is recommended by your endodontist to check the tooth in 6 months to monitor healing, please call to set up your complimentary recall visit when appropriate. Take 600 mg of Ibuprofen (Motrin, Advil, etc.) or 1000mg Acetaminophen (Tylenol) every 4-6 hours. For moderate pain, begin with 600 mg Ibuprofen. Continue to alternate 600mg Ibuprofen and 1000mg Tylenol as needed. These two potent anti-inflammatory drugs work synergistically together to fight inflammation and pain. NEVER exceed any 1 medication sooner than every four (4) hours. You may discontinue the medication as discomfort decreases. If you experience any reaction from the medications which appear to be abnormal, stop the medication and call our office. If this does not relieve your pain, please call us, as Dr. Potter may want to prescribe you a stronger medication. A certain amount of bleeding or oozing is to be expected near the sutures. If needed, you can put some pressure with moist gauze on the area for 30 minutes. You can also place a moistened tea bag directly over the surgical site for at least 10 minutes, holding it in place with moderate biting pressure. If bleeding continues, repeat. Do not smoke for 24 hours. Forceful spitting and excessive physical activity tend to increase and prolong bleeding. Resting in a semi-reclining position for the first few hours is highly recommended. Take your pain medication as directed by your doctor. It is likely that Dr. Potter will prescribe a prescription mouth rinse (Chlorhexidine/Peridex) for your surgery. You should rinse twice a day with this for 30 seconds. Do not eat or drink for 30 minutes following your rinse. In addition to this prescription rinse, you may also rinse with warm salt water 4 or 5 times a day for several days (add 1/2 teaspoon of salt to a glass of warm water). After 24 hours you may gently brush your teeth. However, flossing in the area of surgery should be avoided. To help minimize ordinary post-operative selling, apply an ice pack to the face over the area of surgery for a few hours. Place the ice pack on for 5-20 minutes, followed by a 5-20 minute break, and repeat. It is important to maintain a good diet and remain well hydrated following your surgery. A liquid to soft-food diet is advisable for the first 2 days. This includes such things as applesauce, soup, pudding, Jell-O, spaghetti, ice cream, malts, etc. You should drink at least 8 glasses of liquid per day. Feel free to contact us if any concerns arise regarding your recovery. Avoid strenuous activity for the remainder of the day. Smoking and alcohol consumption should be avoided for three days. Avoid facial manipulation as much as possible. Do not raise the lip or retract the cheeks to inspect the surgical site as you may dislodge the sutures (stitches). Swelling and discoloration (bruising) sometimes follows surgery. To minimize this, apply an ice bag alternately 5-20 minutes on, 5-20 minutes off, for a few hours following the surgery. You will be advised to return to our office 3-7 days following surgery for a post-op evaluation by Dr. Potter and any necessary suture removal.